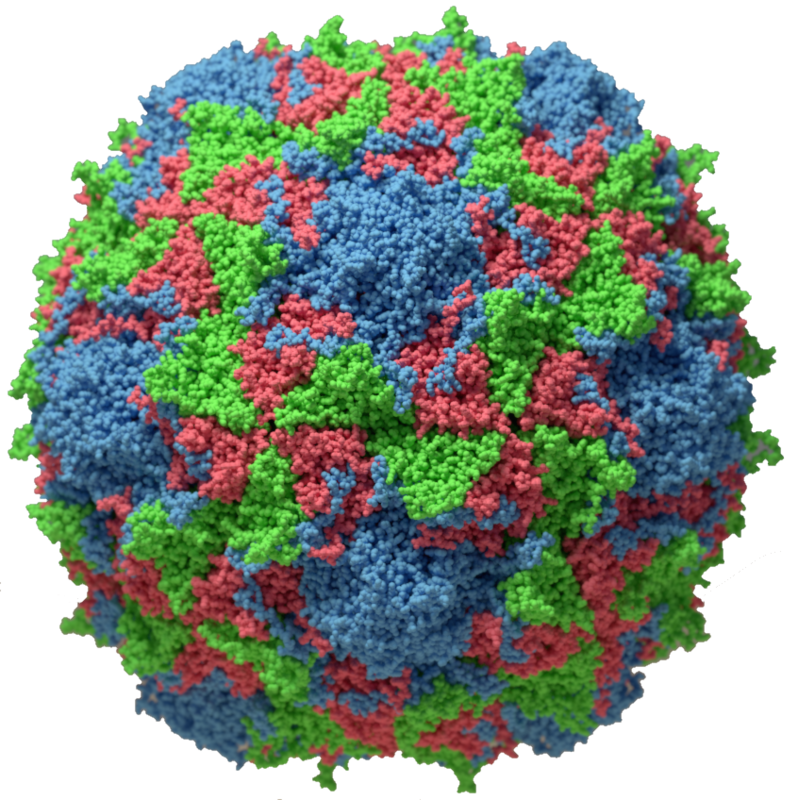 I cannot let September pass without noting that 34 years ago this month, I arrived at Columbia University to start my laboratory to do research on poliovirus (pictured). 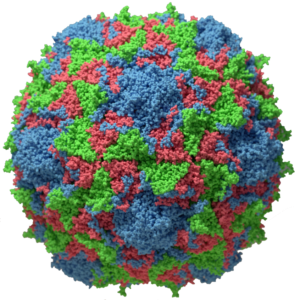 That virus is no longer the sole object of our attention – we are wrapping up some work on poliovirus and our attention has shifted elsewhere. But this is a good month to think about the status of the poliovirus eradication effort. So far this year 26 cases of poliomyelitis have been recorded – 23 caused by wild type virus, and three caused by vaccine-derived virus. At the same time in 2015 there were 44 reported cases of polio – small progress, but, in the words of Bill Gates, the last one percent is the hardest. One of the disappointments this year is Nigeria. It was on the verge of being polio-free for one year – the last case of type 1 poliovirus in Nigeria had been recorded in July of 2014. In August the government reported that 2 children developed polio in the Borno State. The genome sequence of the virus revealed that it had been circulating undetected in this region since 2011. Due to threats from militant extremists, it has not been possible for vaccination teams to properly cover this area, and surveillance for polioviruses has also been inefficient. The virus can circulate freely in a poorly immunized population, and as only 1% of infections lead to paralysis, cases of polio might have been missed. The conclusion from this incident is that the declaration that poliovirus is no longer present in any region is only as good as the surveillance for the virus, which can never be perfect as all sources of infection cannot be covered. Of the 26 cases of polio recorded so far in 2016, most have been in Afghanistan and Pakistan (9 and 14, respectively). It is quite clear that conflict has prevented vaccination teams from immunizing the population: in Pakistan, militants have attacked polio teams during vaccination campaigns. Recently 5 of 27 sewage samples taken from different parts of the province of Balochistan in Pakistan have tested positive for poliovirus. Nucleotide sequence analysis revealed that the viruses originated in Afghanistan. The fact that such viruses are present in sewage means that there are still individuals without intestinal immunity to poliovirus in these regions. In response to this finding, a massive polio immunization campaign was planned for the end of September in Pakistan. This effort would involve 6000 teams to reach 2.4 million children. Apparently police will be deployed to protect immunization teams (source: ProMedMail). The success of the polio eradication program so far has made it clear that if vaccines can be deployed, circulation of the virus can be curtailed. If immunization could proceed unfettered, I suspect the virus would be gone in five years. But can anyone predict whether it will be possible to curtail the violence in Pakistan, Afghanistan, and Nigeria that has limited polio vaccination efforts?